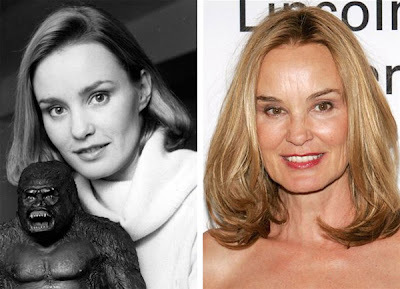 Jessica Lange before and after plastic surgery. 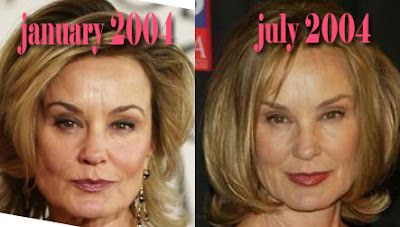 Has the legendary Academy Award winning actress, Jessica Lange, succumb to the pressures of aging gracefully, and opted for plastic surgery? Reports from Jessica's reps have stated vehemently, that the rumors are false and the actress has not had any type of facial plastic surgery. However, these before and after pictures tell a different story, a story filled with plastic. If i had to take a stab at which operations she has underwent, i would point to her forehead, which seems extremely tight, perhaps the result of a brow lift. Also, the appearance of her eyes have changed significantly, which would likely be the result of an eye lift. There's gotta be another way for these beautiful women to age gracefully. Healthier habits, more sleep, perhaps? All these former beauties look so squeezed together & tight now........yucky. I feel bad for Jessica, she genetically did not get a fair deal in the skin department. Because she started wrinkling prematurely she is probably desperate to find a solution. She and Linda Hamilton suffer from the same bad sort of skin. I think she's a heavy smoker. That would explain it all.